When I was seventeen (I am fifty-five at present), I purchased a book that changed my life. It was called The Magic and Methods of Ross Bertram, and it contained the explanations of extremely difficult (although I did not appreciate this at the time) technique by one of the virtuoso sleight-of-hand artists of the twentieth century, Ross Bertram. Ross, it turned out, lived in Toronto, about ten minutes by car from my home. Through the machinations of a couple of magic enthusiasts (Msgr Vincent Foy (now 101) and the late P. Howard Lyons), I met Ross and soon, became his sole protégé. 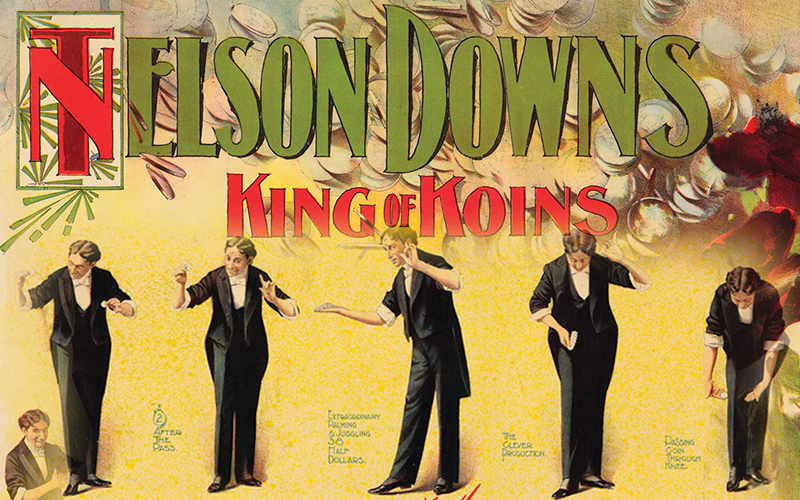 Ross was very interested in a magician named T. Nelson Downs, who performed under the moniker the “King of Koins” in the early part of twentieth century. Indeed, Downs performed at the Palace Theatre (the Mecca for variety entertainers) in London, England for a run that lasted over six months—unprecedented at any time. Downs established a new way of performing magic on stage, one that was clearly attributed to his technical skill rather than magical incantations. His poster said it all: “The World’s Unequalled Palmist and Prestidigitateur. Introducing Only Original & Sensational Coin Manipulations & Comic Conjuring Creations Unassisted by Magicians Apparatus.” Wow! Amongst the cognoscenti, Downs performed something they dubbed as his “masterpiece”—the vanishing and recovery of six large silver coins. Since his passing in 1938, many magicians have tried to replicate both Downs’ effect and his technique, but to no end. I myself have worked on the piece for over thirty-five years—and six years ago, I had a major breakthrough. Shortly afterwards I acquired a letter from the period that confirmed my suspicions. I had figured it out. (At least a good part of it.) And then, beyond belief, Mike Caveney, one of the great modern-day magicians and magic historians in the world today, gave me a present—the very coins that Downs used while performing the piece over one hundred years ago. So, I had the technique and now the actual coins that Downs used while performing it. I did not have, however, the exact choreography . . . which turned out to be a good thing for it gave me licence to use my own imagination to frame the piece based on images of his movement (much like the way Opera Atelier has recreated historical dance), and from hints embedded in vernacular photographs and correspondence between Downs and his confrères. Downs broke a barrier. He proved that one could admit and demonstrate technical skill, and still inspire wonder—not the wonder of technique, but the wonder that stems from unabashed astonishment.